Gennady Golovkin is said to be a bit uneasy about returning to Las Vegas to fight Canelo Alvarez in a rematch of their September 16th throwdown. Golovkin promoter Tom Loeffler recently spoke with MMA Junkie and claimed “there are some things we’d want to address if the fight goes back to Vegas.” One of those things, presumably, is some of the judging that goes down in Las Vegas’ fights. Judge Adalaide Byrd gave boxing yet another black eye when she ruled in favor of Canelo over Golovkin by a score of 118-110 after their much hyped – and exciting – superbout several weeks ago. While there was little doubt the battle between the two middleweights was extremely close and perhaps even difficult to score, few, if any, felt like either fighter deserved to win by so wide a margin as the one given by Byrd. The whole thing proved to be a tough pill for many fans to swallow, one made even tougher by boxing’s history of unfair judging. 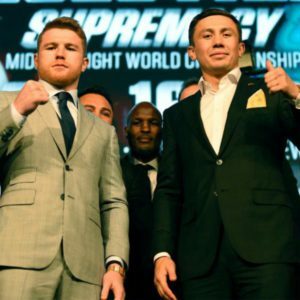 With a rematch between Golovkin and Canelo appearing inevitable, some are openly stating that it will be hard for Golovkin to ever get a fair ruling in Las Vegas, a town with a reputation for playing favorites. The Nevada State Athletic Commission swears by its own honor of course, but analysts, fans, and it seems Golovkin himself are rightfully suspicious. Speaking of the judging that night, Loeffler stated that “it’s just unfortunate that people are talking about the scoring instead of the fight itself.” Known as an even keeled sort, the soft spoken Loeffler’s statements speak volumes. 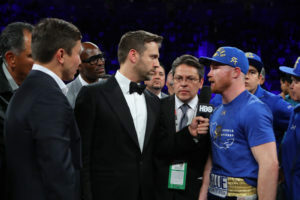 Although the man didn’t outright condemn the city of Vegas for the actions of one judge, he made it clear that his camp has legitimate concerns heading into a rematch with the extremely popular Canelo. Anthony Joshua is set to fight Wladimir Klitschko at the T-Mobile Arena on November 11. Joshua stopped Klitschko in the eleventh round of their colossal battle at Wembley Stadium back in April. A fight that broke British records in grossing revenue and attendance and now they are set to do it all over again. As the Joshua brand goes from strength to strength, his promoter and marketing mastermind, Eddie Hearn has been keen to showcase the star outside of the UK. Initially, it seemed they were taking the fight to the Far East, then there were whispers of a showdown in Nigeria, but now it seems the fight is set to take place in Boxing boulevard – Las Vegas. Both Hearn and Joshua have been touring the US and theNevada city and the Matchroom boss reveals that he has held talks with representatives of MGM and the T-Mobile Arena as he looks to try and seal the rematch. Speaking to Sky Sports News HQ, Hearn said: “I’ve been in Vegas with AJ, officially applying for my Nevada boxing license to promote there and that went well. “I met with the MGM and met with the T-Mobile Arena, Vegas is the front runner and November 11 is the date that is pencilled in. “It will probably take a couple of weeks to get everything over the line, but I believe Klitschko will take this fight and believe Vegas will be the one. “AJ has been over there for about 10 days and has enjoyed himself and got to know the area a little bit. Sergey Kovalev will attempt to redeem his lone defeat against Andre Ward on June 17th, Live on HBO Pay per view. Kovalev has been very outspoken in the media about his disdain for Ward and that he felt ‘Cheated’ out of his titles the first time they fought. We were able to briefly speak with Sergey as he is entrenched in the middle of his training camp in California. Boxing Insider: What was running through your mind when the judges read all 3 scorecards were for Ward? Sergey Kovalev: When I hear him say ‘and the new…’ I could not believe what I was hearing. Boxing Insider: What do you need to do different in this fight to make sure you win? Sergey Kovalev: I was “over-trained’ for my first fight against Andre Ward. I did three work outs a day. I tried to do everything faster, more, and stronger. Instead of running five miles, I did eight miles. I did more than I usually do all the time. I over-trained.This time I do everything less, more smart. Boxing Insider: The last time we spoke I asked “do you think you can actually knock Andre Ward out?”…you answered, “I don’t know”. Nowthat you have fought him, can you knock out Andre Ward? Boxing Insider: What are some things that impressed you with the way Ward fights? 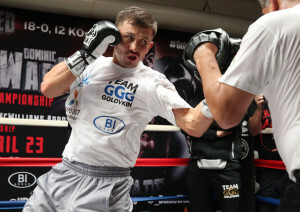 Boxing Insider: Will you change anything in this training camp compared to the last? Sergey Kovalev: My preparation right now is doing great, much better than last time because I took care of all the mistakes I did last two fights. Two last fights I was over-trained, for Chilemba and for Ward, and I fought similar. But this training camp I am doing everything very good. I am doing the same training, but less. Boxing Insider: What are your true feelings about Andre Ward, is it hate, respect, etc.? Sergey Kovalev: I do not like this guy. I want to destroy this guy as a boxer, as a champion. For me he is not a champion, he’s a fake champion. Boxing Insider: If you do win this rematch, would you make Ward fight outside of his comfort zone? 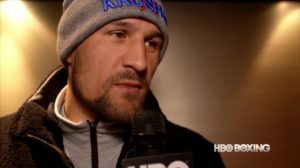 Sergey Kovalev: Let’s see first what happens on June 17th. First of all I must get back my belts, we’ll see what will happen after this. Boxing Insider: Since he missed your HBO Faceoff, Is there any message you’d like to send to Andre Ward right now? Sergey Kovalev: He’s playing with me, but what’s broken you makes you only stronger right? I only care that I should beat him on June 17 and get back my belts. Many people wanted the September 16th Canelo-Alvarez-Gennady Golovkin superfight to happen in Texas, at the AT&T arena, home of the famed Dallas Cowboys. Of course, fight fans had a right to want to see the fight there. AT&T is a location that might actually be able to fit a record setting crowd. And, after this past spring’s Anthony Joshua-Wladimir Klitscko war in front of 90,000 people in England, fans could only be expected to hope for the same kind of explosive atmosphere back here in the states. Canelo-GGG is the biggest legitimate fight in boxing, after all. What’s more, the sport has been on the uptick in a big way. Why not continue to ride the wave by letting the world see just how big boxing can be in America in 2017? Unfortunately, for those hoping for a thrilling Texas night, Oscar De La Hoya announced on ESPN today that Canelo-GGG will, in fact, be happening at the T Mobile Arena in Vegas. Once again, Sin City will host the sport’s biggest match. So much for reasonably priced tickets. So much for an event exclusively of and for the fans. Still, it would be unfair to bash De La Hoya or Golovkin promoter Tom Loeffler for this. Boxing, as we’re forever reminded, is a business, after all. As long as the big fights are being made, fans can only complain so much. None of that is to say that the [email protected] arena’s Jerry Jones didn’t work hard to make the fight go down in the same building where his Cowboy’s play. Ultimately, though, the allure of Vegas proved to be too strong. “The city’s ability to attract high-rolling gamblers helped it bankroll the unrevealed site fee,” wrote the LA Times’ Lance Pugmire. What’s more, De La Hoya made it clear that Vegas is a party town and that there’s a lot more to a big fight than the big fight itself. Surprisingly enough, Vegas has, until now, not hosted Golovkin, perhaps the most feared individual in all of combat sports today, in a high level match. Canelo, on the other hand, can be seen as a Vegas regular, as he’s fought in major bouts in the city on numerous occasions – most famously against Floyd Mayweather in 2013. Speaking of Mayweather, it’s been mentioned that perhaps Floyd’s interest in fighting MMA star Conor McGregor in a boxing match may have had some impact on the decided location for Canelo-GGG. De La Hoya and Loeffler, after all, wouldn’t want Floyd fighting in Vegas around the same time their own major event was going down. Now that the biggest question in boxing, the one about if and when Canelo would face GGG, has been answered, fans and analysts are looking for a new mystery to be solved: Where will the fight be held? This may all seem somewhat ridiculous on the surface of things, but it’s not. They say real estate is essentially about location, location, location, and, although location may not be AS big a deal in boxing as it is in real estate, it certainly is important. The Rumble in the Jungle, The Thrilla in Manilla, Shelby Montana, the list of notable fight locations can be rather extensive. Remember that the first heavyweight champ, John L Sullivan, would actually fight on a barge, out of reach of authorities. One can only imagine what it must have been like trying to employ effective footwork. The matter of location, however, has become particularly acute in recent weeks. Why? 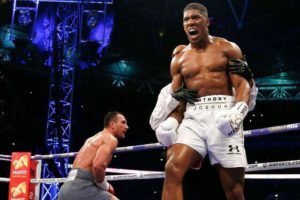 Because Anthony Joshua and Wladimir Klitshcko battled for heavyweight supremacy in front of a reported ninety thousand people in London last month. That’s more than the population of some cities. And with that many fans came that much intensity. The atmosphere at Wembley Stadium for Joshua-Klitschko was positively explosive. In fact, it helped accentuate the experience of viewing a terrific top level matchup. 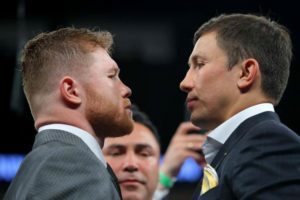 The bout, in all its aspects, was just the kind of thing boxing needed, and now fans would love to see the same intensity when GGG steps into the ring to face Canelo in September. Needless to say, a large scale venue for such an anticipated fight would make for terrific optics and atmosphere. Yet there’s Vegas, always Vegas, in the running. Indeed, Sin City is still THE place for professional boxing. There’s a lot of money to be made in the desert, after all, generally more than there is anywhere else. It’s only logical to put the biggest money fights there. Still, those with vision will want to please fans with at least somewhat affordable seats and plenty of them. They will also recognize that fights placed against epic backdrops tend to draw lots of attention. It will be hard for even the most boxing-indifferent mainstream outlets to ignore Canelo-GGG should the fight go down in front of, say, a sold out [email protected] Stadium in Dallas. Fans will undoubtedly know where this match is occurring soon enough. Here’s hoping it’s someplace as electric as London was a few short weekend’s ago. 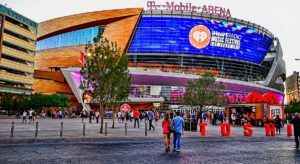 The T-Mobile Arena in Las Vegas has quickly become the new hotspot to for big fights time pay per view fights and was the host site for tonight Golden Boy Promoter pay per view card headlined by Julio Cesar Chavez Jr. and Canelo Alvarez. The first bout of the under card was between Joseph Diaz Jr. (23-0) and Manuel Avila (22-0) in the featherweight division. Avila pressed forward in the opening moments of the first round but was a little short with his punches while Diaz was sharp with his straight left right hook combination. Diaz’s jab controlled the distance in the first and second rounds. Diaz stayed disciplined in the second and selectively slipped through his counters. Avila slipped at the end of the second round and looked slightly off balance. Avila had a good third round with some good shots to the body, but Diaz ended strong with a straight left followed by a short left hook Avila forced his combinations in the fourth and fifth round and may have landed more punches, but Diaz landed the harder counters but wasn’t as active as Avila. 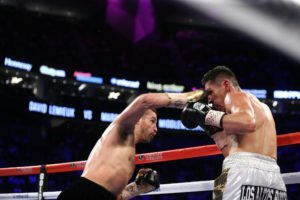 A cut above Avila’s left eye was bothering him in the sixth round and Diaz took advantage by pressing his attacks and landing hard straight left hands. The sixth was Diaz’s most dominant round of the night at this point of the fight. Diaz’s seventh round was just as good as the sixth. His right hook to the head and body was especially on point, and the highlight of this round was a Diaz combination on Avila by the corner. Diaz was in clear control in the eighth round and landed some good shots to the body of Avila. Diaz staggered Avila twice in the ninth round and nearly scored a knockdown. Avila needed a knockout in the final round to win, but he didn’t come close to achieving it. The final scores were 100-90, 99-91, and 99-91 for Joseph Diaz. The next bout of the night was between Lucas Matthysse (37-4) and Emmanuel Taylor (20-4) in the welterweight division. This was Matthysse’s first fight since his knockout loss to Postol, but he came out strong behind his double jab and landed good shots to the body and head. Matthysse landed a straight right at the end of the first round that hurt Taylor, but Taylor was able to survive the round. Taylor was pensive of Matthysse’s power in the second round and was taking several hard combination. Matthysse had Taylor covering up by the ropes on more than one occasion in the second. Taylor came out aggressively in the third round but head butted Matthysse early on and forced the referee to momentarily stop the bout. Taylor came right at Matthysse when the fight resumed, but was tagged with a straight right hand that send him down to the mat. He was able to get back up and shake off the punch, but the power of Matthysse was being felt. Matthysse’s aggression carried him through the fifth and sixth rounds as Taylor’s power paled in comparison to Matthysse. Matthysse landed a a hard combination on Taylor by the ropes in the fifth round that busted the nose of Taylor and sent him crashing to the mat. Taylor as able to get up before the count of ten, but he was still on wobbly legs and the referee stopped the bout. Lucas Matthysse wins by KO at 2:21 of the fifth round. 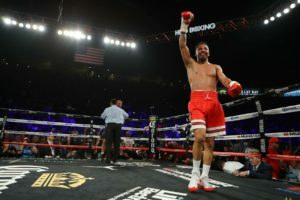 The final bout on the undercard was between David Lemieux (37-3) and Marcos Reyes (35-4) in the super middleweight division. Lemieux comes out showing good head movement, but Reyes was able to land his jab in the first thirty seconds in the bout. Lemieux connected good shots to the body and was chasing Reyes around the ring and invested in the body. Reyes was able to land some good jabs, but Lemieux was clearly the aggressor. Lemieux was able to open up a cut over the eye of Reyes in the second round and forced Reyes to grab on nearly every time he landed a shot. Lemieux hard a dominating third round and was landing some heavy, heavy, power shots. Reye’s right eye was bleeding badly and his chin was tested often this round, but somehow he stayed on his feet the entire round. Lemieux’s power display continued in the fourth round with a straight right hand that knocked out the mouthpiece of Reyes. However, Reyes was able to land some surprising right hands near the end of the round that may have stunned Lemieux. Reyes is a little more active in the fifth round and lands some good punches on Lemieux and even outboxes Lemieux. Reyes chin tested often, but it somehow stays strong and he may have landed more punches than Lemieux in the fifth. Lemieux appeared to be fighting more cautiously in the sixth round as his activity slowed down, Reyes however picked up his activity and threw a high volume of punches. Lemieux was able to regain control in the seventh round with a vicious left hook that forced Reyes to hold on and slowed him down significantly. That control continued into the eighth round as Reyes badly needed a knockdown to turn the tide of the fight around. Reyes fought valiantly and displayed great heart and a sturdy chin in the final two rounds, but he was not match a boxer with the pedigree of Lemieux. David Lemieux wins by decision with scores of 99-90, 99-90, and 98-91. On Saturday night HBO will televised another Canelo Alvarez Pay Per View as he takes on fellow Mexican boxer Julio Cesar Chavez Jr. This bout will take place at the T-Mobile Arena in Las Vegas, Nevada during Cinco De Mayo weekend. Hopefully, the winner of this bout, expected by many to be Canelo, will be next in line to take on the current middleweight kingpin Gennady Golovkin. At least two bouts will be shown on the undercard, including Golden Boy mainstays David Lemieux and Lucas Matthysse. Super prospect Joseph Diaz will also likely be on the televised portion of the card. The following is a preview of the three main fights. The hard hitting Lucas Matthysse has long been a fan favorite, but has not competed since being knocked out by Viktor Postol in 2015. Matthysse will be giving up one inch in height to Taylor but will have a significant four inch reach advantage. Age may be a factor for Matthysse as he is thirty four years old and eight years older than his opponent. Inactivity will also be a factor for Matthysse; he fought zero times in 2016 and twice in 2015. Taylor fought twice in 2016 and once in 2015. Matthysse was an amateur champion in Argentina but did not have a lot of success on the international circuit as an amateur. Taylor is a three time National PAL Champion and a five time junior golden gloves champion. Matthysse has the more impressive list of defeated opponents. He has beaten the likes of Ruslan Provodnikov, Roberto Ortiz, John Molina Jr., Lamont Peterson, Mike Dallas Jr., AJose Olusegun, Humberto Soto, DeMarcus Corley, and Vivian Harris. He has closes losses to Zab Judah and Devon Alexander, and had more convincing losses to Danny Garcia and Viktor Postol. Taylor has defeated the likes of Karim Mayfield, Victor Manuel Cayo, and Raymond Serrano. His losses were to Antonio Orozco, Adrien Broner, Chris Algieri, and Prenice Brewer. Taylor has gone 3-3 in his last six fights and has difficulty beating opponents on the highest level. Matthysse has been inactive the past two years, but has faced and defeated opponents with a much better pedigree than Taylor. Matthysse should win this bout and should possibly give Taylor his first knockout loss. Many consider Lemieux to be the third best middleweight behind Gennady Golovkin and Canelo Alvarez. Unfortunately for fight fans, Lemieux has the easiest opponent on paper for the night. Lemieux is one year younger than his opponent and will be giving up about four inches in height. Lemieux has thirty three stoppage victories on his record while Reyes only has twenty six. Both boxers have been stopped during their careers, as Lemieux has two stoppage defeats while Reyes has one. Reyes has no notable amateur background and Lemieux is a three time Canadian National Amateur Champion. Lemieux has defeated the likes of Curtis Stevens, Glen Tapia, Hassan N’Dam N’Jikam, Gabriel Rosado, Fernando Guerrero, Jose Miguel Torres, Hector Camacho Jr., and Elvin Ayala. He has losses to Marco Antonio Rubio, Joachim Alcine, and Gennady Golovkin. Reyes only good win was to Rogelio Medina. His losses were to Elvin Ayala, Julio Cesar Chavez Jr., Abraham Han and Amilcar Edgardo Funes Melian. Some fights are close calls and hard to pick. This isn’t one of them. This is one of the biggest bouts to be made between two Mexican boxers. One is considered by many to be the heir apparent to the throne of Floyd Mayweather Jr. when he retires. The other is the son of a legend and very successful in his own right. Canelo was a former Junior Mexican National Boxing Champion and turned pro at the age of fifteen. Chavez only had two amateur fights and no notable amateur accomplishments. Chavez is thirty one and is starting to near the end of his physical prime. Canelo is only twenty six and has a lot of years left in boxing during his physical prime. Chavez will have a noticeable size advantage. He will be four inches taller than his opponent and will have about a two and a half inch reach advantage. Both boxers have some power in their hands, but Canelo appears to have the advantage. Canelo has thirty four stoppages on his resume and has stopped three of his past four opponents. Chavez has thirty two stoppages on his record, but only one of his last five opponents failed to go the distance with him. Canelo has a very impressive list of defeated boxers and has averaged two fights a year since 2012. He has defeated the likes of Liam Smith, Amir Khan, Miguel Cotto, James Kirkland, Erislandy Lara, Alfredo Angulo, Austin Trout, Josesito Lopez, Shane Mosley, and Kermit Cintron. His lone loss was to Floyd Mayweather Jr.
Chavez has defeated the likes of Marcos Reyes, Brian Vera, Andy Lee, Marco Antonio Rubio, Peter Manfredo Jr., Sebastian Zbik, and John Duddy. He has lost to Andrzej Fonfara and Sergio Martinez. Chavez has claimed that he is rededicated to the sport and training hard for this fight. However, his inability to stay focused for fights during training has been long documented and it’s hard to suddenly say I’m going to be in shape for this fight when you haven’t taken your training seriously in the past. Canelo is too good and too technical for someone like Chavez to suddenly commit to the sport of boxing wholeheartedly to defeat. 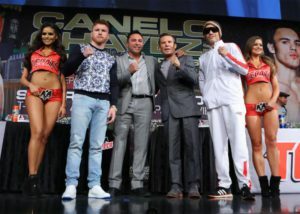 Chavez will have his moments, but Canelo will emerge victorious. These words came from a Tweet today from light heavyweight kingpin Andre Ward. Shortly thereafter, one was able to find some major observers of the boxing world taking to the internet to declare (via sources) that a Ward rematch with Sergey Kovalev was a done deal. 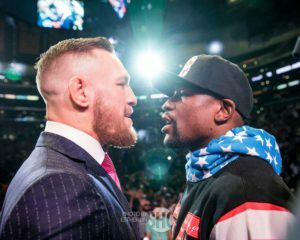 What’s more, the date of the rematch was said to be June 17 at the T-Mobile Arena in Vegas. Naturally, it wasbeing stated that the fight will appear via pay per view (you didn’t expect it on CBS, did you?). If word around the campfire was to be believed, a press conference announcing the much anticipated battle will occur next week. Long story short…Ward-Kovalev II is on. Ward knocked Kovalev off his light heavyweight pedestal with a highly controversial decision late last fall. It was a good, close fight, no matter how you look at it and a rematch is most certainly in order. Still, there was fear in some circles that Ward was far less than interested in facing the Russian again anytime soon. So much for that line of thinking. As expected, Manny Pacquiao 59-6-2 (38 KO’s) soundly defeated former WBO Welterweight Champion Jessie Vargas 27-2 (10 KO’s), capturing the WBO title for a third time. The result was not a surprise. Pacquiao is still one of the best fighters in the world, proving this by defeating a top pound for pound fighter, Timothy Bradley 33-2-1 (13 KO’s) earlier this year. Although the results against Vargas were expected, we learned a few things in the process. We learned the validity of Pacquiao’s star power is questionable. The polarizing star that was Manny Pacquiao since simmered due to the sound defeat by the hands of retired rival, Floyd Mayweather 49-0 (26 KO’s). Was Pacquiao’s popularity and commercial success is stemmed from his association with Mayweather’s name? Has his social stances and involvement in politics played a factor? Whether the decline of popularity stems from the backlash of his derogatory comments about homosexuals, the myriad of excuses as a result of losing to Mayweather, or what some would consider lack luster performances against Mayweather and Bradley, it appears the star power is no longer there. Pay-per-view numbers are down, attendance is down and the fans do not want to see these match-ups. Pacquiao-Bradley 3 was not on the wish list, nor was Pacquiao vs. Vargas. Speaking of Pacquiao vs. Vargas, the event itself was lackluster; not too many casual fans even knew about the fight. HBO, the home network for Pacquiao dating back more than 10 years, wanted nothing to do with this fight and for good reason. The bout was advertised as The Legend (Pacquiao) vs. The Champion (Vargas), speed (Pacquiao) vs. power (Vargas), the recently retired, future Hall of Famer returning one more time to take on the surging star, seeking to cement his placement and legacy among the boxing landscape. We learned this was nothing more than another mismatch; a trend we’ve witnessed many times from Bob Arum when match-making for Pacquiao. Think Chris Algieri and Brandon Rios. Rios, Algieri, and Vargas are by no means bad fighters. They are clearly not on the same tier as Pacquiao. With this recent match-up, clearly we have a case of false advertisement. Vargas and the term “power” do not necessarily belong in the same sentence; he boasted a whooping knockout rate of 35 percent entering his fight against Pacquiao. Real power would be Pacquiao versus Keith Thurman 27-0 (22 KO’s), or Danny Garcia 32-0 (18 KO’s), or Shawn Porter 26-2-1 (16 KO’s) or even Errol Spence 21-0 (18 KO’s). These matches mind you, are now an open possibility now that boxing lords Bob Arum and Al Haymon have seemingly established a temporary truce and they handle all of the fighters mentioned. 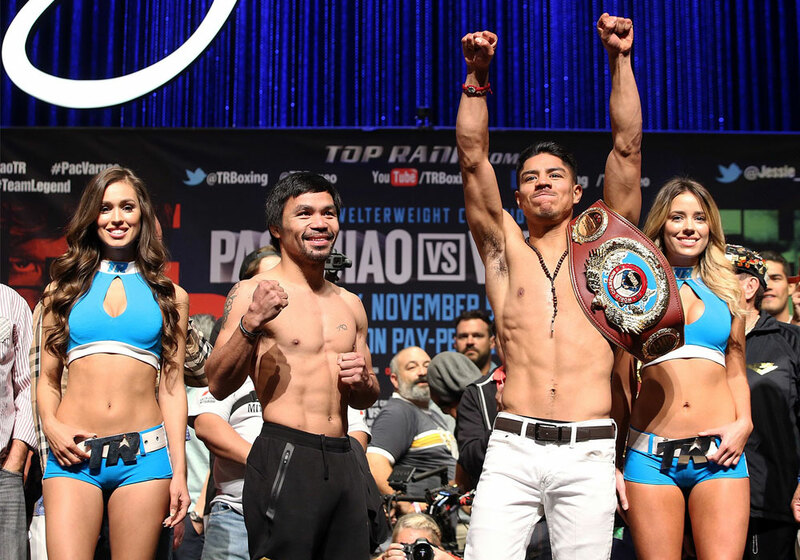 Against Vargas, Pacman held the advantages of speed, power, skill, experience; every variable imaginable. There was a longer layoff between fights for Vargas compared to Pacquiao, and Pacquiao is supposed to be the “retired” fighter. The other potential match-ups for Pacquiao mentioned however, present a different story and a different series of problems compared to Vargas. We learned The Senator from the Philippines is still a pretty good boxer and should not quit his day job. No he is not the fighter he once was at age 28. But the hand speed is still there, the fluidity of feet, his movement is there, punching power is still present, along with his ability to overwhelm opponents with his experience and ring intelligence as opposed to relying on the punch output of his younger years. We learned Stephen A Smith should not do commentary for boxing events. Ever. As talented and intelligent as Mr. Smith is, boxing is not his strong suit. He even had the audacity to argue back and forth with fellow play by play commentator, former world champion, Timothy Bradley. Incorrectly addressing Guillermo Rigondeaux the “Ax Man,” a moniker reserved for Nicholas Walters, improper timing, inaccurate analysis of the fights generally speaking, Smith appeared out of place. We learned Pacquiao never retired. It’s difficult to imagine Pacquiao actually retired in April, only to return in November. That is about as believable as the mystical healing properties of the ocean healing Pacquiao’s shoulder injuries as he claimed last year. There’s much to speculate about regarding why Pacquiao continues to fight. He is a senator and holding a seat in political office is a full-time job. So why continue to fight? Especially when you’ve conquered the sport a few times over, winning multiple world titles across several weight classes. We learned this was an audition for a rematch against Mayweather. Why else was the “retired” Mayweather in attendance? Be hard pressed to believe he was there solely to support his former fighter Jessie Vargas. It’s fair to suggest, Floyd “Money” Mayweather loves money and would capitalize on an opportunity to reel in a ton of it. Coincidentally, so does Pacquiao and Arum. A rematch featuring Pacquiao and Mayweather would generate hundreds of millions. Much to the chagrin of another interested spectator in attendance of Pacquiao’s last fight, Terence Crawford 29-0 (20 KO’s), who would love a piece of the Pacquiao pie. Crawford, the two division world champion, 2014 Boxing Writers Association of America Fighter of the year recipient, would love nothing more than to capitalize on an opportunity to fight Pacquiao. Crawford’s trainer Brian McIntyre, wants the same and constantly expresses confidence his fighter will defeat Pacquiao if the two ever meet, which appears unlikely any time in the near future. But as the days pass, manifest destiny becomes ever so clear. Mayweather recently had a sparring session, came to watch Pacquiao fight, Pacquiao winked at Mayweather in route to comprehensively defeating his opponent who stood no real chance of winning; the stars are aligning ladies and gentlemen. The shoulder injury and drama to follow their encounter in May of 2015, left the door open for a rematch. This is something all parties involved wanted. Because who can pass up all that money? No matter how many the fans complain, people will pay to see Pacquiao vs. Mayweather. And it’s a decision that actually makes the most sense for Pacquiao. The only thing he can lose is the match. Another potential loss against Mayweather will not negatively impact his legacy, while a win can only boost his legacy. A win against Mayweather trumps any significance a win from gathered against Spence, Thurman, Garcia or Porter. We learned this is a serious discussion regarding the two. Money talks and more than likely, we can anticipate seeing Manny Pacquiao in the ring for the foreseeable future.